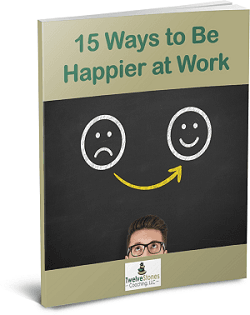 Do you need to be happier at work, or know someone who does? How about 15 Ways?! This week's episode of The Marketing Checklist radio show we learned from Business Coach Deirdre McGee (well, we started with a few tips for your direct mail envelope with more to come next week). We met Deirdre when we spoke at the Chicago Chapter of the International Coaches Federation. “Deirdre McGee is a professional Career Management and Leadership coach and owner of Twelve Stones Coaching, LLC. Her career includes more than 30 years of internal and external organizational effectiveness consulting; management; employee and leadership development; education and training development and delivery; and team and workgroup development. Deirdre has been a skilled and trusted advisor and coach to senior leaders, colleagues, and clients. She focuses on building collaborative partnerships and provides support and practical feedback to help clients address changes in their personal and professional lives. Deirdre also integrates coaching techniques and helpful tools to offer a highly personalized program tailored to her client. With compassion and understanding, she works with clients to help build their strengths and attain the personal growth they are committed to achieving. “Perhaps you’re in a job you’re comfortable in, or with a company you like, but you’d like to amp up your enthusiasm level. Maybe you want better working relationships, or you’d like to reduce your stress level. You might feel as though you’re not accomplishing much. Would you like to create your book in 8 hours? Please come join us at BookDay, and stay for our Small Business Marketing Plan Bootcamp!